AmeRRuss Blade Arts presents this highly ambitious work for the first time. Once again J.D. has forged a blade of great complexity and beauty. Imposing at 22” in length, it’s six bar composite of simple core twists and razor sharp “firestorm” edges form a lethal and visually imposing sword blade. The hilt is a masterpiece of metalsmithing skill and design.The cast sterling silver guard is inset with a special mosaic Damascus steel collar that snuggly fits to the blades base. Multiple bands of diamonds and rubies add a high degree of richness and visual appeal. 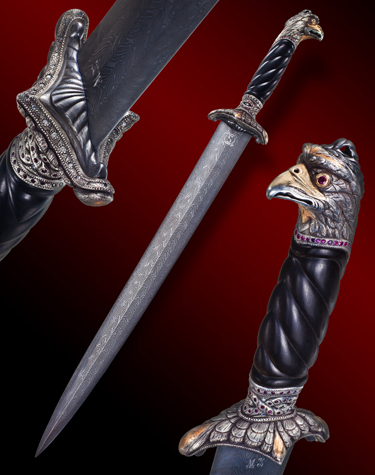 The carved African Blackwood hilt terminates in an eagle’s head cast from sterling silver layered with gold, then meticulously detailed with engraving by Joseph. Two large rubies glow intensely from the eagle’s baleful stare. Measures: Blade: 20" Handle: 7" Total Length: 27"